Imagine’s media relations specialist, Tiffannie Bond (left), and director of media relations, Melissa Biernacinski (right), pictured with PRSA Las Vegas’ president, James Stover, APR. HENDERSON, Nev. – Imagine Communications, a Henderson, Nev.-based full-service marketing and public relations company, was awarded a Pinnacle Award (in the media kit category) by the Public Relations Society of America’s Las Vegas chapter. 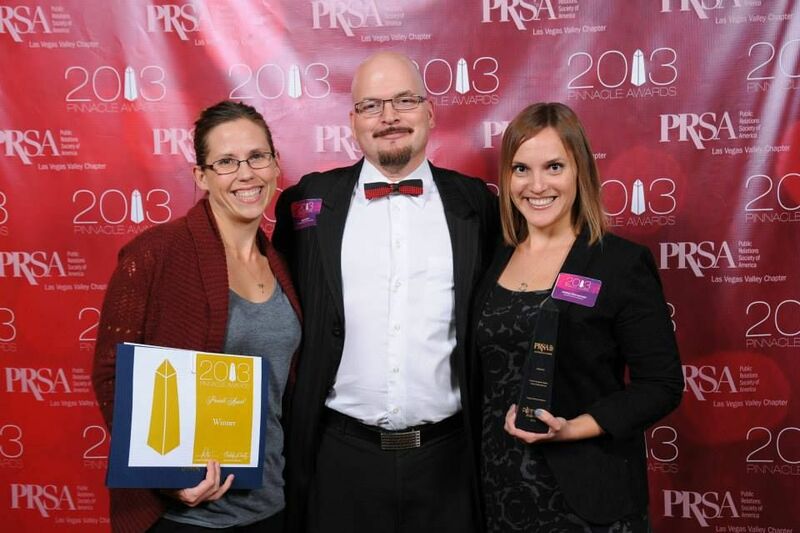 Entries were judged by PRSA’s San Diego chapter. Imagine’s director of media relations, Melissa Biernacinski, and media relations specialist, Tiffannie Bond, accepted the award Wednesday, Nov. 13, during the organization’s annual Pinnacle Awards ceremony.